On Saturday, thousands took to the streets to protest President Trump's executive order that effectively bans Muslim immigrants from entering the country. 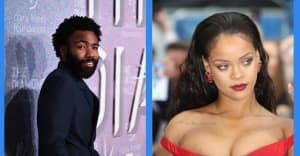 In a show of solidarity with those protesting and act of resistance to the Trump administration, several celebrities and artists took to Twitter to express their outrage at the state of the country, including Rihanna, Cher, John Legend, Chrissy Teigan and more. Sia and Grimes both took to Twitter to announce that they were matching donations to the ACLU and the Council of American-Islamic Relations, respectively. Author of Bad Feminist, Roxane Gay, also matched up to $3500 in donations to the ACLU. Shark tank judge Chris Sacca also announced that he matched $150K in donations to ACLU. See all of their reactions below. We need an O signal in the sky like a bat signal for President Obama.